Our never ending 364 day per year search for outcross polled genetics brought us to the Ferme Gagnon sale, September 28th, Cheneville, Quebec. There was certainly an impressive set of Fleckvieh cattle on display that September day. However, the most intriguing lot for me was the very rare and seldom offered “pick of the 2013 born bull calves” . With 40 plus bull calves to chose from,” WOW” what an opportunity. We were looking for a polled outcross youngster that could perhaps have what it takes to help get us to the next level. The calf that got me excited was” FGAF Wow Effect 016A”…. 94 lb birth weight, outstanding performance, with tremendous length of spine, a natural calf and out of perhaps the most complete Fleckvieh cow we have ever seen. Yes, Wow Effect is polled and has an extremely quite disposition, a big plus for us. The next order of business was to out bid the packed sale ring full of Breeders from across Canada for the right to bring Wow Effect here to Dora Lee. We were successful and our new herd sire arrived here October 4th. I am cautiously optimistic that Wow Effect has what it takes to once again raise the bar. 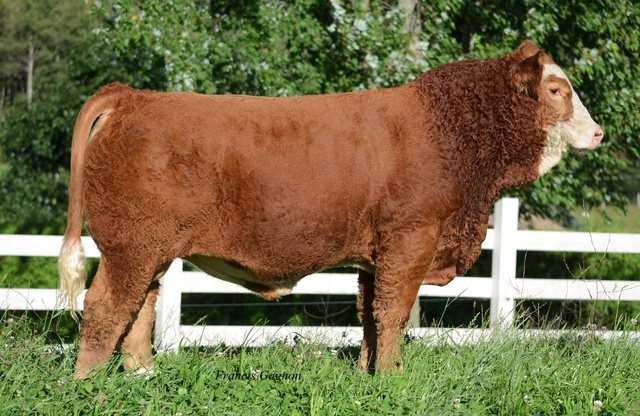 ” Fullblood polled Fleckvieh genetics at their best”.